We added a splash of natural fruit flavor to our popular sweet poppy recipe and came up with this delicious Raspberry Poppy Dressing! 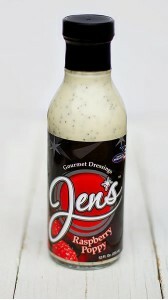 Made in small batches from fresh ingredients like all of our dressings, it’s the perfect compliment to your meals. Add to salads to make them pop with fruity flavor! Kids love it, too. Try as a marinade for meats and seafood for a hint of sweetness. Delicious topping for fruit, pancakes, and, of course, any kind of salad. Our raspberry poppy seed salad dressing is a customer-favorite for spinach & strawberry salads – yum. We warn you – it’s addictive! Yummy….this is so Tasty….love the Raspberry Poppy Dressing….